Apartments at Vardanants Street are located in the centre of Yerevan, 5 minutes’ walk from the Republic Square. Hanrapetutyan Hraparak Metro Station is 500 metres away. All apartments come with air conditioning and free WiFi. Guests can use a fully equipped kitchen, and it’s possible to order breakfast at surcharge. Various cafes, bars and restaurant are located within 10 minutes’ walk from the apartments. Apartments at Vardanants Street include a comfortable bedroom, nicely decorated living room and modern bathroom. Slippers, hairdryer, washing machine and ironing facilities are available. Zvartnots International Airport is 14 km away, and a shuttle service is available on request. Yerevan Central Railway Station is about 8 minutes’ drive from the apartments. * 5 minutes’ walk from the Republic Square. *Hanrapetutyan Hraparak Metro Station is 500 metres away. *Zvartnots International Airport is 14 km away. *Shuttle service is available on request. 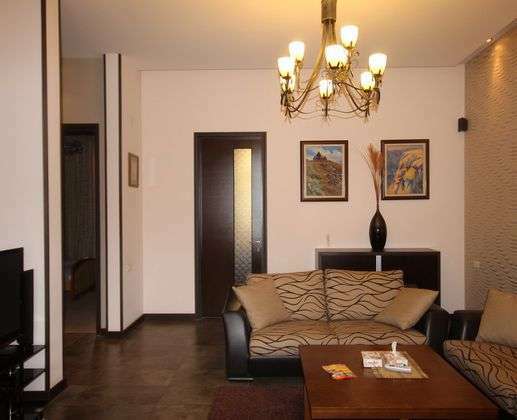 *Yerevan Central Railway Station is about 8 minutes’ drive from the apartments.